Samantha Hodgson was born on May 9, 1987 and started her riding career at the age of five. level. Samantha further trained her PSG mount (Harli) to Grand Prix. made extremely positive and inspiring comments regarding her natural ability, agility, and talent. talent and ability with each horse to exemplify its individual attributes. scores as high as 77.50% at the Grand Prix level. participate in the Region 1 Advanced/FEI Jr/YR Clinics with George Williams. and the prestigious Dressage at Devon ***CDI Horse Show a total of 3 times. Samantha, earning numerous awards at the Regional and National level. 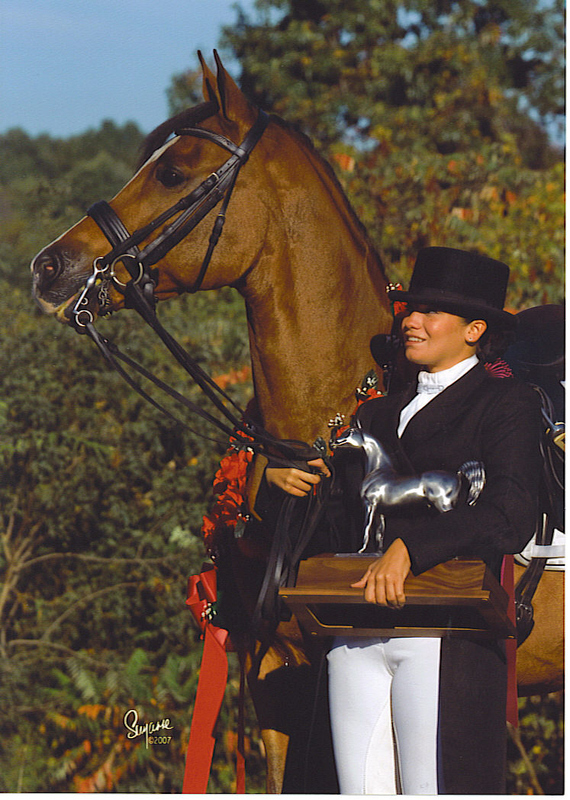 In 2009 Superior Dressage Horses was formed by Samantha and her mother Dawn Hodgson. Dressage Horses focuses on the training, showing, and sales of top quality dressage horses. Services also include lessons, clinics, and a FEI school master program. allows her to obtain her goals. foundation of each one of them by working as a whole, along side with their equine companions. at the ECRDA Championship Show. Nation's College Students receive this rank. through Grand Prix at Open A rated shows. Oct 2007- BLM Reserve Champion Intermediate II and Third Place Grand Prix. bestowed only on the top 1% of college students. Central Eastern Europe, China, and India Summer of 2008. Dec 2007- Graduated from Burlington County College with a small Business Certificate. History, and also, in qualifying FEI (NAYRC) Classes. College students receive this award. TV production of "America's next dressage Star"
only been partners for 8 short weeks. Challenge, which is a program of the President's Council on Physical Fitness and Sports. Jan. 2005 - Earned status of Presidential Classroom Scholar. Invited to Washington, D.C. Warrant A 3.5 + G.P.A by invitation only in recognition of Academic Excellence. combination experience, score checks, and committee/panel review, and selection. April 2005 - Advanced level president's challenge "Bronze Medal"
May 2005 - Advanced level president's challenge "Silver Medal"
June 2005 - Achieved advanced level president's challenge "Gold Medal"
Oct 2005 - Dressage at Devon 1st ***CDI w/Beymoon Zela+ in the FEI Yr riders classes. Placed 1/2 a point behind an imported small tour warmblood, ridden by a Nayrc Medalist. Cesar Parra on a buying trip to Europe, and spectate the Frankfurt Show. recognized by the U.S. Dept. of Health and Human Services. have been offered and granted. Maintained 3.75 G.P.A; Honor Roll Status; Principal's List - Senior High School. Sport Horse In-Hand, in multiple organizations and registries. attitude, and exemplifying hard work at Seneca High School. Center For The Arts in Southern NJ. Seneca High School Academic Award – Recognition of the Center For The Arts show. highest achieving students in high school are even considered for this honor. Maintaining a G.P.A. of 3.0+ Freshmen, Sophomore, and Junior years in high school. high school credits, which she earned in only three years. HSPA (High School Proficiency Assessment) – Advanced Proficient Status. USDF Jr/Yr Arts Contest – Participating contestant (**winners to be announced in Oct.
AHA, USDF, USAE, AWR/ASPR, PHR, ESDCT, and ECRDA. as numerous other eligibility requirements. a member reflects and is based upon art scholarship, service, and character. be a participant at Dressage At Devon, which she has fulfilled. years, commendably maintaining a 3.0+ G.P.A. Honored for academic performance. peer tutor to classmates (eight years). achieving academic excellence. Invited to participate six consecutive years.